The first owner, Edmund Wood, was a wealthy merchant grocer who became Sheriff, then Mayor of Norwich in 1548. His son Robert was also Mayor, and in 1578 he received Queen Elizabeth I when she visited Norwich, entertaining her to “a Loyal Latin Oration”, in return for which she knighted him. The next known owner, Thomas Toft, was also a grocer and Mayor (1654), of extreme Puritan views, and took an active part in the destruction of statues and “superstitious pictures and reliques of idolatry” in churches and in the Bishop’s palace. During the 18th century, the dwelling was split into shops, and in 1801, the Bull Inn can be found at No.11; later, we find a grocer, a saddler and a bootmaker. Finally, in the last quarter of the 20th century, the street frontage was occupied by 3 shops, the upper level by small flats, and the whole in a dilapidated condition. The restoration of Nos. 11 to 15 was completed in 1990, and the rest of the street corner onto Fishergate (nos. 7-9) was acquired in 2000. The architect, John Sennitt, won a Civic Award for the project. The building comprises two halls, one above the other, and an inner courtyard, each with many features of interest. 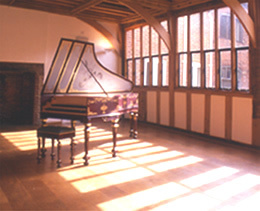 The ground floor hall, which serves as the Art Gallery, has a beamed ceiling in a star-shaped pattern and a very long mullioned window; in the upstairs hall, used as a Music Room, a painted ceiling with moulded beams was revealed underneath Georgian plaster. More interesting features were found as the restoration proceeded: two fireplaces, and in the courtyard, a high mullioned window and a carved and painted arch. 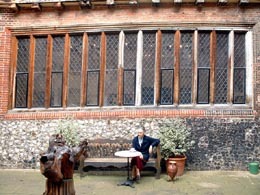 The King of Hearts is a superb Tudor building located in the historic centre of Norwich, which hosts a variety of activities. 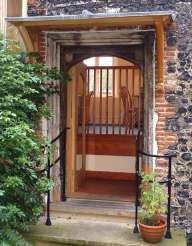 Two fine medieval halls house a Contemporary Art Gallery and a Music Room; a small craft shop serves as a showcase for East Anglian artists and also sells books: art, poetry and children’s stories. 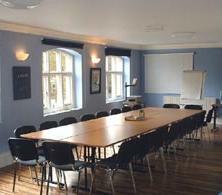 Four meeting rooms are available for training, lectures, working meetings, corporate entertainment or social occasions, and a lively Café and peaceful courtyard provide an informal and relaxed atmosphere. 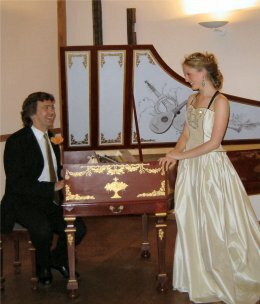 The architectural and historic interest, as well as the artistic feel of the building, make it a unique setting for a great variety of events. Since its opening in 1990, the King of Hearts has developed into a meeting place for people and the arts, bringing to a piece of heritage the energy and creativity of contemporary life. It has created a welcoming environment where people can enjoy the arts in an unpretentious atmosphere, without any sense of exclusivity or elitism. 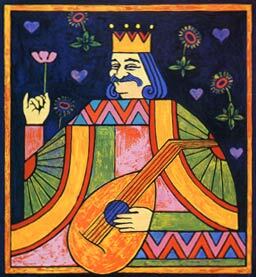 It is also a place of hospitality: in an age of anonymity and gigantism, the King of Hearts seeks to provide a small haven of beauty and relaxation, where personal service and quality events are offered without hype to everyone without distinction.